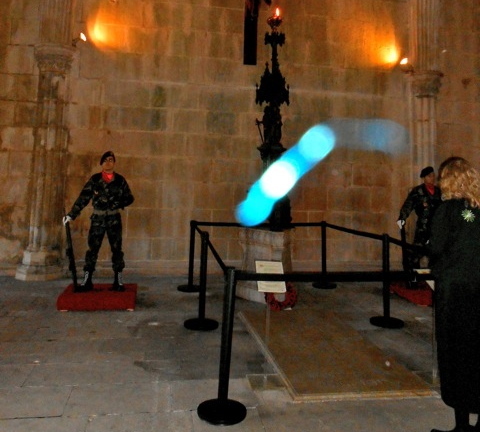 The following photos are just a few examples of orbs with discrete, hard to refute messages. (2) Help with the heart transplant. The girl with the orb had received a heart transplant at age two. Two such group pictures, each showing one orb on this one girl, were taken at this school event. This handicapped girl is attentively watching an orb -- seeing what most people do not normally see. This mentally challenged girl shows an orb connecting her brain with her mouth, as if to indicate "... one day you will be able to speak ..."
The orb shown on the arm of this charming, jewelry-appreciating young woman takes on the shape of a diamond. Several pictures on file taken of this disk jockey in action show orbs with the same interiorities. This orb photo, taken in 1/1000 sec, was formed by a multitude of "quantum-step"-like displacements of one orb, ending up with the appearance of a fairy. This orb placed itself at the signature triangle of the Casa de Dom Inacio in Abadiania, Brazil, on the altar of a spiritual gathering. This photo was the one that spurred Klaus' research into orb interiorities, resulting in the conclusion that orbs tend to adapt to shapes expected by their photographers. ... taken with telephoto lens mode: the orb is focused in far distance from the camera. with his mom and soon-to-be-born sister. (The orb is in form of a "light shaft" to clarify the message). "ORB" was the winning and final word placed at this scrabble game ... just simple coincidence ??? Before the second morning's meeting: an orb marks the place of each seminar participant. (15) "The Mill on the Floss"
Two orb accompany Klaus and Gundi during their presentation at an Intl. Orb Conference in Palm Springs. This photo, one of a series of 30 orb photos, all showing this many orbs each, had a very uplifting personal meaning for the photographer. A beautiful example of the playfulness of orbs with children. The interiority of orbs is often adapted to what the photographer likes/expects to see. An unconventional "orb" appearing in the form of a Spirit Guide -- a Puma -- of the photographer. (23) Affirming the "Light Worker"
An unconventional orb centered over the throat of a person chanting to the world. Three (!) such photos with orbs were published in Spiegel On-Line on 7/15/14 in an article on the 2014 FIFA World Cup. (9) We took this photo in Hude, Germany. Our analysis includes that the intelligence behind orbs favorably uses background features such as to minimize the energy required to imprint this orb on the photo charge plate. (Details in "Orbs, Their Mission and Messages of Hope" and also here). (11) We took this photo in a large auditorium, approximately 50 yards from the stage, with a x3 telephoto lens. (14) Photo courtesy of Reza Ansari -- due to the daylight situation in a room with much non-uniform features, the orbs are somewhat difficult to see, but 6 orbs can clearly be seen (one for each participant of the AWE retreat held in this room). (15) The photographer, Freda Chaney, immediately recognized two female faces in this orb. This enticed her to read the book on which the orb was attached, and she learned astounding similarities between the life of the author and her own life, leading to a life-saving realization. (Details in "Orbs, Their Mission and Messages of Hope" and in a book forthcoming by Freda Chaney). (16) Photo courtesy of Melissa Horton. (17) Photo courtesy of Isabella Lawira. (18) Photo courtesy of Jeanne Marie Brennan. (19) Photo courtesy of Melissa Davenport -- more about this astonishing report of a child playing with an orb can be found here. (21) Photo courtesy of Kristin Novljan, Austria. (22) Photo courtesy of Erich Hunter, Ph.D.
(24) Photo found in "Spiegel on-Line" 7/15/14. Two other photos in the same article showed an orb in similar size. The combination of distance of the camera from the soccer players, the high-power telephoto lens used, and sharpness of the orb contours unquestionably places the orb to within 3 feet from the persons, far away from the camera, and determines that it was about 4" in size. They have individualistic features and may have "faces"
Book: "Orbs, Their Mission and Messages of Hope"